The weekend box office was dominated by book adaptions. Coming in first for the second week in a row is Gone Girl, starring Ben Affleck and Rosamund Pike, bringing in $26.8 million, raising its domestic total to $78.28 million. 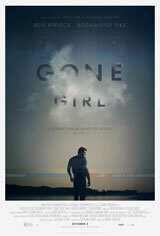 David Fincher‘s adaptation of Gillian Flynn’s bestselling novel of the same title follows Nick Dunne (Ben Affleck) dealing with the disappearance of his wife, Amy (Rosamund Pike). The thriller currently holds a 3.8 star Tribute user rating and just edged out newcomer Dracula Untold, which came in second. Dracula Untold brought in $23.46 million its first weekend. The reboot stars Luke Evans as Vlad, who is forced to make a deal with supernatural forces in order to protect his kingdom and family. The film has a solid 4 star Tribute user rating. The third adaption comes from the third placed Alexander and the Terrible, Horrible, No Good, Very Bad Day. The film, based on Judith Viorst’s book of the same name, follows Alexander (Ed Oxenbould) as he experiences the worst day of his life. Also starring Steve Carell and Jennifer Garner, the film grossed $19.1 million in its opening weekend and currently holds a 4.25 star Tribute user rating. After coming in second place last weekend, Annabelle (3.5 star Tribute user rating), dropped to fourth, grossing $16.37 million for a two-week total of $62.16 million. The horror film, starring Annabelle Wallis and Ward Horton, centers around a couple who begin to experience supernatural phenomena involving a vintage doll.